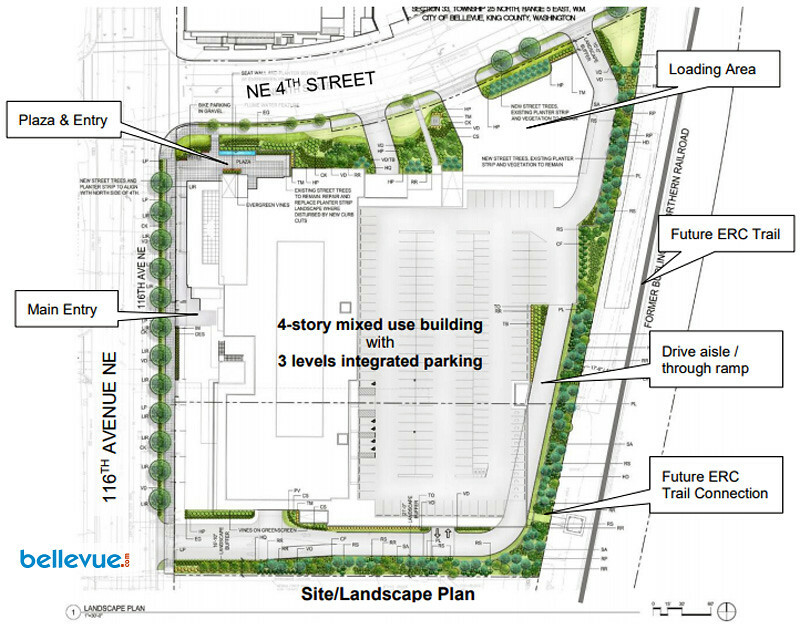 City of Bellevue approved a design review for the development of a 5-acre site located at the southeast corner of the intersection of 116th Avenue NE and the recently extended NE 4th Street. 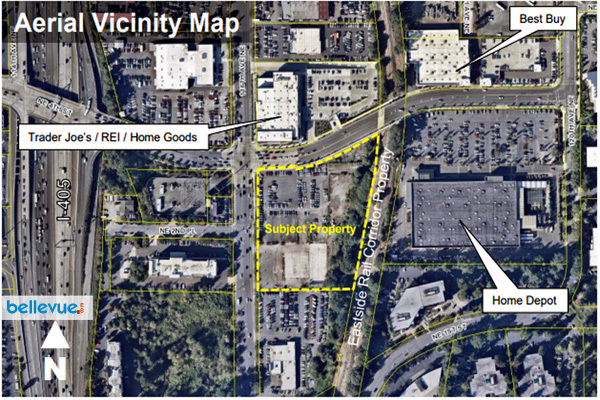 The project site sits directly south of the Bellevue Central Shopping Center that opened in late 2016 and is home to HomeGoods, Trader Joe's and REI. 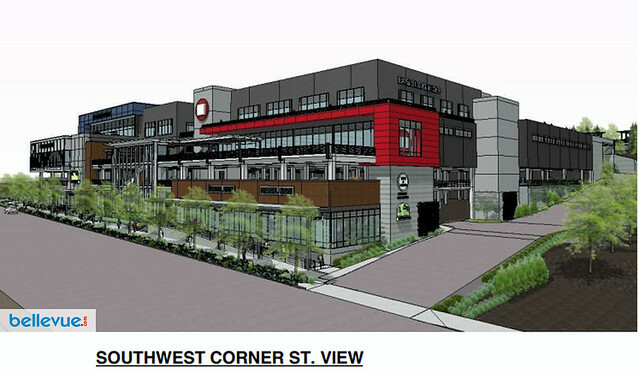 Level 1: 26,600 square feet for grocery tenant and nearly 13,000 square feet for two retail shops. Level 2: Main parking garage with 298 parking stalls. Parking will be accommodated with 695 parking spaces on three levels of an open-air parking structure that is integrated into the building. 189 parking spaces will be on level 1, and 208 parking spaces will be on level 4. 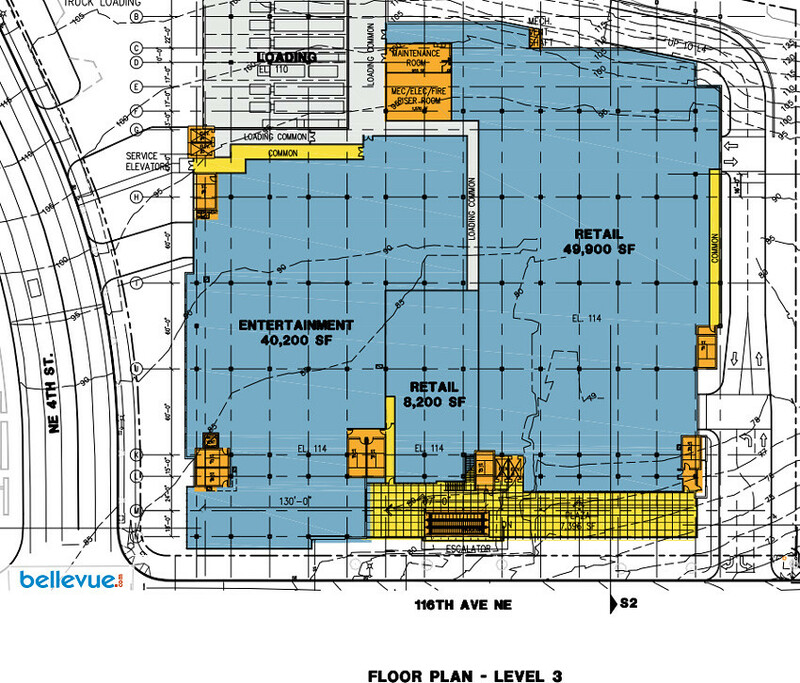 Level 3: 40,2000 square feet for commercial amusements/entertainment use, 49,900 square feet for a large retail use and a smaller 8,200 square feet retail use. 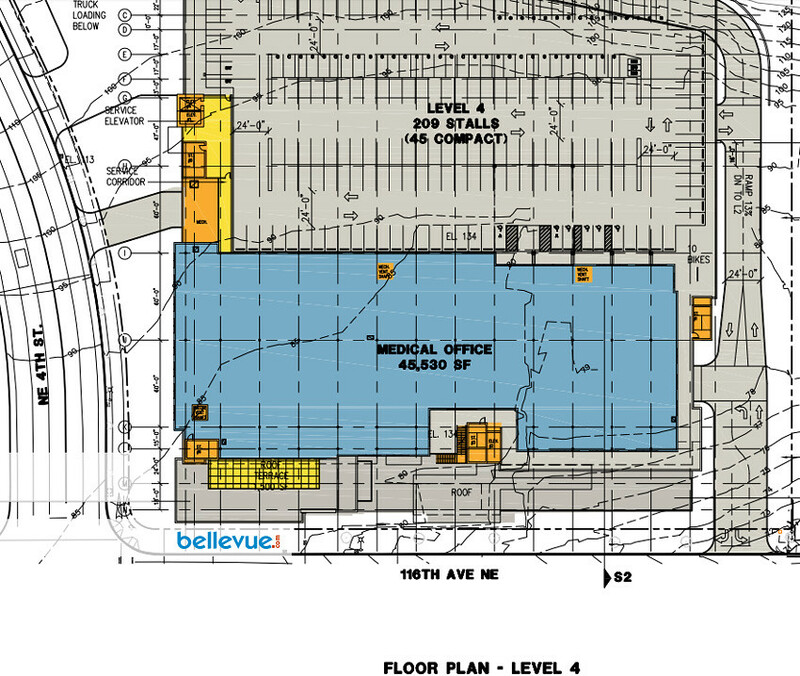 Level 4: 45,530 square feet of medical office space. The northwest corner of the site, at the intersection of NE 4th Street and 116th Avenue NE, will be a focal point with a public plaza that also serves as a secondary pedestrian entrance to the development and specifically to the planned grocery tenant. 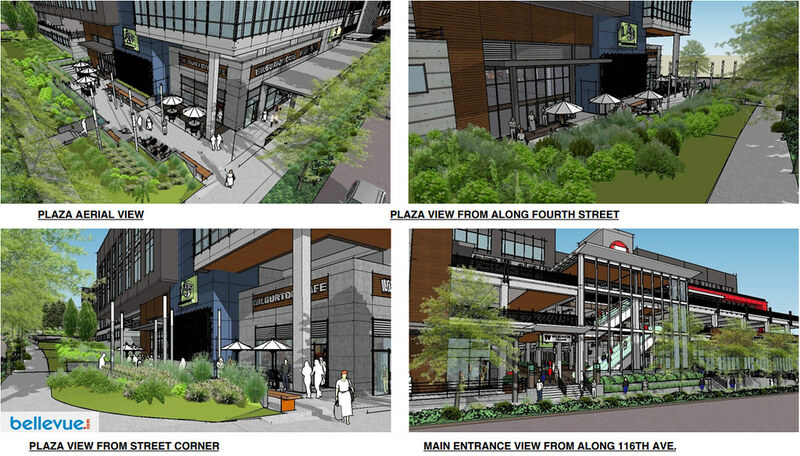 The plaza will invite pedestrians to sit and enjoy the plantings and water feature, browse the storefronts, enjoy a meal or drink outdoors, or simply linger. The plaza will include bicycle parking and plentiful seating and will be enhanced with a flume water feature, an evergreen vine living wall building, along with decorative shrubs, grasses and other vegetation. Decorative lighting will encourage use of the space in the evening. The design review showed that Dave & Buster's will be the lone tenant occupying the 40,200 square feet space on level 3 designated for commercial amusement and entertainment use. The Dave & Buster's space will include entertainment, restaurant, games, bar and video arcade type uses. 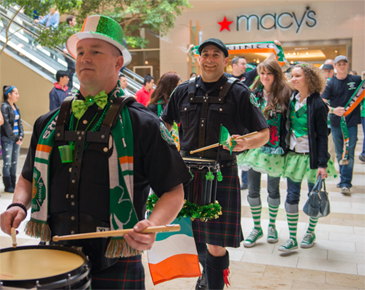 This will be the second Dave & Buster's store in Washington state. The other store is located in Auburn. 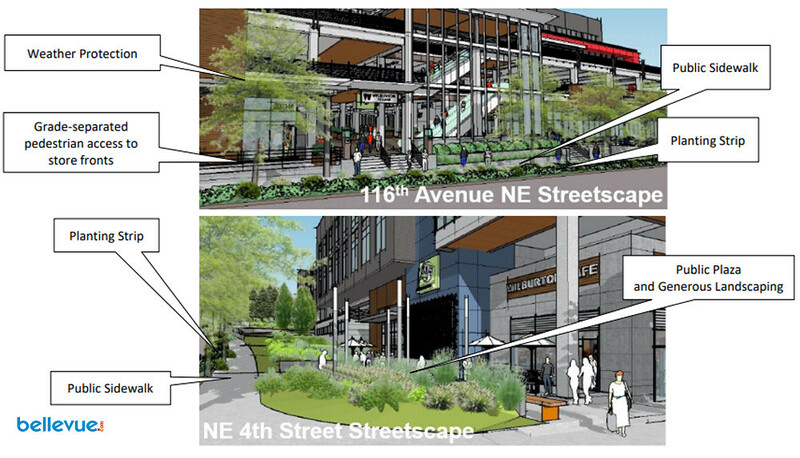 For decades, the stretch of road along 116th Avenue NE between NE 8th Street to the north and Main Street to the south--Bellevue Auto Row--has been home to car dealerships, but as downtown Bellevue has grown over the years, some of the dealers have left or gotten bought out by larger national chains. 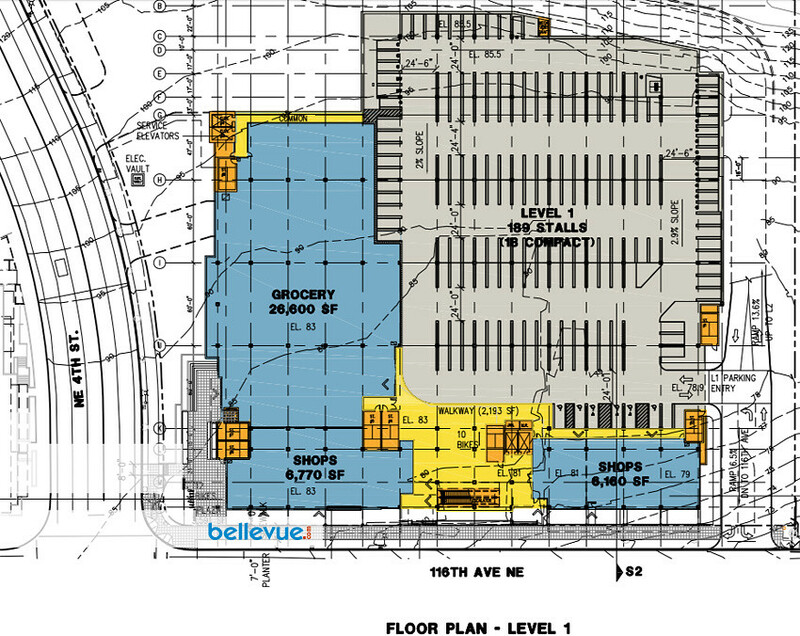 What do you think of having a Dave and Buster's right here in Bellevue? Also, what tenant do you want to see in that grocery space? Share your comments on our Facebook page.